Hamas and Fatah terrorists are able to freely use the internet, thanks to the smartphones they smuggle into their cells, a report in Ma'ariv says. The term “country club prison” is usually associated with the terms of imprisonment for non-violent white-collar criminals – but in Israel, it's the hardened terrorists who do “easy time,” at least when it comes to communicating with the outside world. While garden-variety miscreants are isolated from society during their jail terms, Hamas and Fatah terrorists are able to take advantage of the best the internet has to offer, thanks to the smartphones they smuggle into their cells – and which, they say, prison officials know about, but ignore, in order to ensure “industrial quiet” and avoid unrest among inmates. 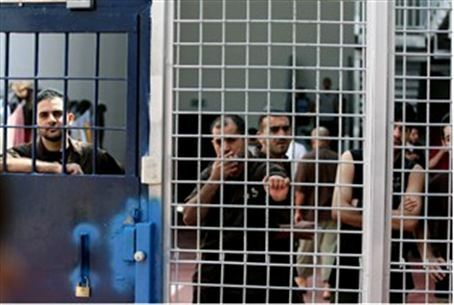 A report in Ma'ariv Tuesday describes how Arab terrorists in Israeli prisons for murder and terrorism communicate via cellphone with friends and relatives on a daily basis. The phones they use all have internet connections, and by using the browsers they come equipped with, terrorists manage Facebook and Twitter accounts, and even “order in” supplies from those who come to visit them. One terrorist, for example, who is serving three life sentences for organizing a suicide bomber attack in Be'ersheva, told Ma'ariv reporter Amit Cohen about his online adventures. Among other things, he posts photos from his prison cell to his social media accounts, and has taken “group photos” with fellow terrorist prisoners and posted those as well. One terrorist was able to listen in to his father's funeral via cellphone, and others have garnered hundreds of “likes” from Facebook users, who know exactly with whom they are connecting, since the terrorists do not hesitate to use their real names. One prisoner even posted a photo of a “banquet” he and his pals conducted within prison walls, using supplies they apparently got from a visitor, who supplied them with fare far better than they could expect from the prison kitchen. Perhaps most disturbing, the Ma'ariv article says, are the interviews the terrorists conduct on a regular basis with Arab media. Some conduct short audio interviews, but in order to avoid undue attention, it has become more popular of late to conduct Facebook interviews, where they simply type in their responses to questions. In order to preserve their “rights,” the terrorists have taken upon themselves not to use their devices for activity that would endanger Israeli security – such as organizing terrorist attacks – the prisoners told Cohen. “The prison authorities know that we have these devices,” one of the prisoners told Cohen. “We have a silent agreement with them. They turn a blind eye, as long as we do not use the devices for activity against Israeli civilians or the IDF.” Prison officials, in turn, get a more cooperative population that does not want to lose its benefit.